La Porte is the kind of small town whose history is quintessential Texan. It started as a real estate development project in 1892. Just as things were getting under way, a huge hurricane ripped through the area in 1900 nearly destroying the entire town. La Porte bounced back and benefited from the oil boom in nearby Houston. It began to build a strong tourist industry based around Sylvan Beach. Unfortunately, the wake of shipping traffic caused the beach to completely erode which caused the tourism business to dry up. But La Porte dug in. Today, with all the surrounding industries, La Porte is keeping step with the rebounding economy by providing folks with a great place to call home. The newest member to La Porte’s business community is also proud to be a part of this thriving community. Junk King of East Houston is one of the newest branches of the national chain of professional junk removal experts. Yes, you can be an expert in the junk removal business. All you have to do is care about the people you’re serving and about the community you’re helping keep clean. Junk King East Houston serves all of La Porte. In that capacity, they are happy to dispatch their teams of capable movers. With every Junk King junk removal appointment you’ll actually be working with a two man crew. Technically, they’ll be doing all the work. All you have to do is point out what you want to be removed and the Junk King crew will take it from there. Since they’ve started to work here in La Porte, the Junk King crews has carted off dozens of sofas, hundreds of mattress and tons of kitchen appliances. As for keeping La Porte clean, Junk King East Houston is proud to follow the lead of the parent company with its eco-friendly policies. These include sorting all your junk to make sure anything that can be recycled will end up at the right place. It could also mean donating your furniture to a local charity. Just because you’re done with something doesn’t mean it has to end up in a landfill! 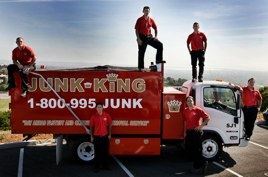 When you’re ready for junk removal, then Junk King is the only call you should be making. Who knows? You might get lucky and have a same day appointment. That means you can wake up with junk but go to bed junk free. This entry was posted in La Porte Junk Removal and tagged junk hauling, Junk King, junk removal, La Porte Junk Removal on February 27, 2014 by Jose Urdaneta. Last updated August 1, 2017 .